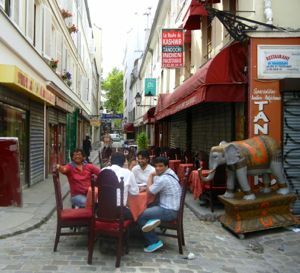 Two passages in the Faubourg Saint-Denis area have a distinct ethnic flavor. Walking into the Passage du Prado is a bit like leaving Paris for India or Pakistan. The passage is full of small businesses, a hotel, and restaurants that specialize in the food and customs of that part of the world. The Passage du Prado was originally built as an open-air passage, with the roof added later. The "street" is thus wider than in some of the passages that were built as passages. It consists of two sections that meet under a rotunda, where the passage turns a corner. It runs between the Boulevard Saint-Denis and the Rue du Faubourg Saint-Denis. A couple of blocks north, between the Boulevard de Strasbourg and the Rue du Faubourg Saint-Denis, is the Passage Brady. This was originally a very long passage, but the creation of the Boulevard de Strasbourg cut it into two sections. 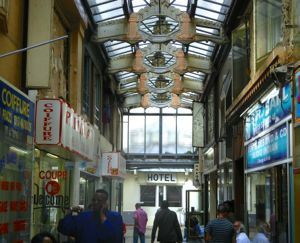 Today the Passage Brady consists of two parts, one open air, more like a lane, with cafés and shops, and another enclosed. Like the Prado, they are centers of Indian and Pakistani businesses. The covered part has been in disrepair and is due for renovation. Both the Passage du Prado and the Passage Brady contain elements of art deco motifs. While you're in the area, you might want to also take a look at a couple historic covered markets, the Marché couvert de St Martin and the Marché couvert Saint-Quentin. Both of these markets date from the mid 19th century. uncovered section of Passage Brady. Métro: Strasbourg Saint-Denis or Château d'Eau. Above, Interesting roof of the Passage du Prado, and walls lined with ethnic shops.